New G-Cloud 10 Accreditation for ISL As the UK’s leading provider of route optimisation software solutions & consultancy services, ISL’s clients & prospects require simple, quick access to the portfolio while still ensuring transparency & best value. ISL is delighted to announce that our full range of products & services can now be procured through the latest G-Cloud 10 framework. The G-Cloud 10 Framework supports the Government’s policy to centrally manage the procurement of common goods and services through an integrated commercial function at the heart of government. G-Cloud 10 can be used by organisations across the UK public sector including central government, local government, health, education, devolved administrations, emergency services, defence and not-for-profit organisations. RouteSmart-for-ArcGIS is the market leading software for route optimisation in the environmental sector applied to numerous services including waste/recycling collections, winter maintenance, street cleansing and gully emptying. Performance Manager is a contract (and contractor) management system deployed by both public and private sector organisations involved in any aspect of environmental service management. Combining Business Process Managament, GIS and mobile technologies, Performance Manager enables organisations to efficiently manager, monitor and report on all jobs/tasks in real time. 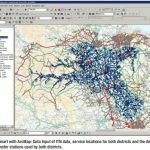 Trafficworx is a software solution for planning and co-ordinating road (street) works used by highways authorities and related stakeholders (utility companies, contractors, emergency services, etc). Delivered as a web service, the solution links the Highways Authority with all those parties that may have reason to undertake road excavations and / or closures as well as those who need to know which roads are closed or are likely to be congested due to road works. As information moves between the HA and stakeholders, applications for planned works are approved and information is automatically published on a website, enabling the public to see where approved road works will be or are currently being carried out. The system also handles a vast array of other processes essential to effective road works planning, co-ordination and implementation including inspection and rectification procedures for reinstatements.